The agreement was signed by Director General of the Department of Forest Inspection of the Ministry of Agriculture and Forestry (left) and Country Director of WWF-Laos (right) with more than 15 representatives from the ministry and WWF-Laos. 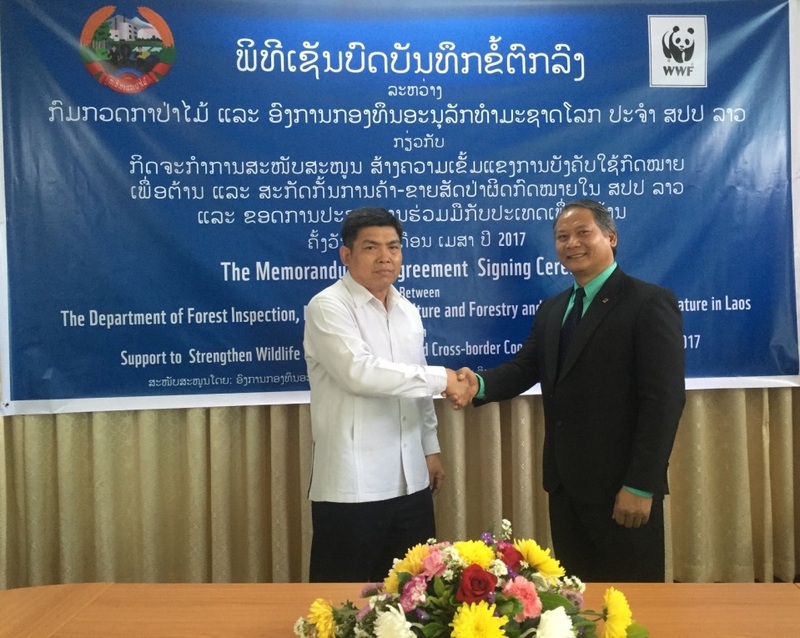 The Department of Forest Inspection and the World Wide Fund For Nature in Laos (WWF-Laos) yesterday signed a Memorandum of Agreement initiating the implementation of a new project aimed at supporting efforts to strengthen wildlife law enforcement and cross-border cooperation. 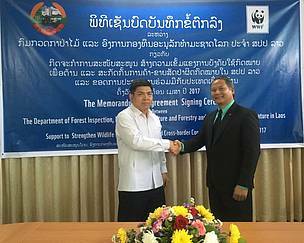 The agreement was signed by Director General of the Department of Forest Inspection of the Ministry of Agriculture and Forestry, Mr. Khamphout Phandanouvong, and Country Director of WWF-Laos, Mr. Somphone Bouasavanh. Recently, Laos has received increased international attention with regard to the issue of illegal wildlife trading. Laos has been identified by many observers as a transit country for the illegal trade of wildlife products coming from Africa, ultimately destined for China and Vietnam, according to a press release from WWF-Laos. Recent reports have also identified that Laos has seen an increased domestic demand for items such as ivory, rhinoceros horns, and tiger products, which are predominantly purchased by tourists coming from neighbouring Thailand, China, and Vietnam. The new project, which began on March 14, 2017, is scheduled to run until June 30, 2018. With a budget of US$85,500 (over 701 million kip), funded by WWF-Switzerland and WWF-Singapore, the project will support the Lao government, in particular the LAO-Wildlife Enforcement Network (LAO-WEN), in combating wildlife trafficking. In particular, the initiative will focus on prioritised species within Laos as identified in the CITES (Convention on International Trade in Endangered Species) agreement, to which Laos became a party in 2014. The project will provide support in the capacity building of Lao government authorities with respect to law enforcement and bilateral cooperation, to address wildlife trafficking issues in Laos and the Greater Mekong Region. WWF is one of the world's largest and most respected independent conservation organisations, with over 5 million supporters and a global network active in over 100 countries.